Fort McCulloch Earthworks 1.5 mi. S.E. Constructed early in 1862 by Gen. Albert Pike, C.S.A as major Confederate stronghold in southern Indian Territory. 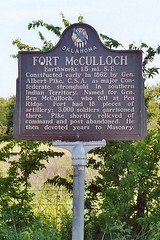 Named for Gen. Ben McCulloch, who fell at Pea Ridge. Fort had 18 pieces of artillery; 3,000 soldiers garrisoned there. Pike shortly relieved of command and post abandoned. He then devoted years to Masonry. Marker is on State Highway 22 (north side of road), west of Kenefic, Oklahoma, 2.3 miles west of the intersection of Highways 22 and 48.